AJ Ross reports from Brussels. BRUSSELS -- Islamic extremists struck Tuesday in the heart of Europe, killing at least 34 people and wounding scores of others in back-to-back bombings of the Brussels airport and subway that again laid bare the continent's vulnerability to suicide squads. Bloodied and dazed travelers staggered from the airport after two explosions - at least one blamed on a suicide attacker and another apparently on a suitcase bomb - tore through crowds checking in for morning flights. About 40 minutes later, another rush-hour blast ripped through a subway car in central Brussels as it left the Maelbeek station, in the heart of the European Union's capital city. Authorities released a photo taken from closed-circuit TV footage of three men pushing luggage carts in the airport, saying two of them apparently were suicide bombers and that the third - dressed in a light-colored coat, black hat and glasses - was at large. They urged the public to reach out to police if they recognized him. The two men believed to be the suicide attackers apparently were wearing dark gloves on their left hands, possibly to hide detonators. 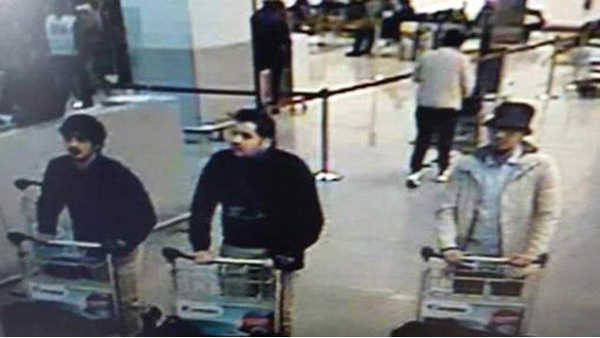 A spokeswoman at the Belgian federal police confirms to ABC News that the picture below shows the possible suspects from the Brussels airport attack. There is no confirmation yet on their identities. Police in Belgium issued a wanted notice looking for the man pictured on the right. In police raids Tuesday across Belgium, authorities later found a nail-filled bomb, chemical products and an Islamic State flag in a house in the Schaerbeek neighborhood, the state prosecutors' office said in a statement. In its claim of responsibility, the Islamic State group said its members detonated suicide vests both at the airport and in the subway, where many passengers fled to safety down dark tunnels filled with hazy smoke from the explosion. A small child wailed, and commuters used cell phones to light their way out. European security officials have been bracing for a major attack for weeks and warned that IS was actively preparing to strike. The arrest Friday of Salah Abdeslam, a key suspect in the Nov. 13 attacks in Paris, heightened those fears, as investigators said many more people were involved than originally thought and that some are still on the loose. "In this time of tragedy, this black moment for our country, I appeal to everyone to remain calm but also to show solidarity," said Belgian Prime Minister Charles Michel, who announced three days of mourning in his country's deadliest terror strike. "Last year it was Paris. Today it is Brussels. It's the same attacks," said French President Francois Hollande. Shockwaves from the attacks crossed Europe and the Atlantic, prompting heightened security at airports and other sites. Belgium raised its terror alert to the highest level, shut the airport through Wednesday and ordered a city-wide lockdown, deploying about 500 soldiers onto Brussels' largely empty streets to bolster police checkpoints. France and Belgium both reinforced border security. Justice ministers and interior ministers from across the 28-nation EU planned an emergency meeting, possibly Thursday morning, to assess the fallout. The subway blast hit beneath buildings that normally host EU meetings and house the union's top leadership. Medical officials treating the wounded said some victims lost limbs, while others suffered burns or deep gashes from shattered glass or suspected nails packed in with the explosives. Among the most seriously wounded were several children. The bombings came barely four months after suicide attackers based in Brussels' heavily Muslim Molenbeek district slaughtered 130 people at a Paris nightspots, and intelligence agencies had warned for months a follow-up strike was inevitable. Paris fugitive Abdeslam was arrested in Molenbeek. A high-level Belgian judicial official said a connection by Abdeslam to Tuesday's attacks is "a lead to pursue." The official spoke on condition of anonymity because the investigation was ongoing. Abdeslam has told investigators he was planning to "restart something" from Brussels, said Belgian Foreign Minister Didier Reynders. He said Sunday that authorities took the claim seriously because "we found a lot of weapons, heavy weapons in the first investigations and we have seen a new network of people around him in Brussels." While Belgian authorities knew that some kind of extremist act was being prepared in Europe, "we never could have imagined something of this scale," Belgian Interior Minister Jan Jambon said. Officials at the airport in the Brussels suburb of Zaventem said police had discovered a Kalashnikov assault rifle and an explosives-packed vest abandoned at the facility, offering one potential lead for forensic evidence. Bomb disposal experts safely dismantled that explosive device. A U.S. administration official said American intelligence officers were working with their European counterparts to try to identify the apparently skilled bomb-maker or makers involved in the Brussels attacks and to identify any links to the bombs used in Paris. The official, who wasn't authorized to speak publicly on the investigations and demanded anonymity, told The Associated Press that at least one of the bombs at the airport was suspected to have been packed into a suitcase left in the departures hall. Several Americans were among the wounded, including an Air Force lieutenant colonel stationed in the Netherlands, his wife and four children who were at the airport. Mormon church officials, meanwhile, said three of its missionaries from Utah were seriously injured in the blasts and were hospitalized. Three intelligence officials in Iraq told the AP that they had warned European colleagues last month of IS plans to attack airports and trains, although Belgium wasn't specified as a likely target. The officials, who monitor activities in the IS stronghold of Raqqa, Syria, said Brussels may have become a target because of the arrest of Abdeslam. One of the officials - all of whom spoke on condition of anonymity because they were not authorized to talk about their knowledge of IS operations - said Iraqi intelligence officials believe that three other IS activists remain at large in Brussels and are plotting other suicide-bomb attacks. European leaders already struggling to cope with a wave of migration from the war-torn Middle East said they must rely on better anti-terrorist intelligence work to identify an enemy that wears no uniform and seeks the softest of targets. They emphasized that Europe must remain tolerant toward Muslims as they seek to identify those on the violent extremist fringe. Leaders of the 28-nation EU said in a joint statement that Tuesday's assault on Brussels "only strengthens our resolve to defend European values and tolerance from the attacks of the intolerant." The U.N. lead official for Middle East refugees, Amin Awad, warned that Europe faced an increasing risk of racist retaliation against Muslim immigrant communities. "Any sort of hostilities because of the Brussels attack or Paris attack is misplaced," Awad said. Reflecting the trauma of the moment, Belgian officials offered uncertain casualty totals at both the airport and subway. Police conducted controlled explosions on suspicious abandoned packages that ultimately were found to contain no explosives. The government said at least 11 people were killed at the airport and 20 on the subway, where the bomb hit an enclosed train car. Later, a security official said the overall death toll had risen to 34, without providing a breakdown of where. In the airport, video posted on social media showed people cowering on the ground in the wake of the blasts, the air acrid with smoke, windows of shops and the terminal entrance shattered, and fallen ceiling tiles littering the blood-streaked floor. Some witnesses described hearing two distinct blasts, with shouts apparently in Arabic from at least one attacker before the second, bigger explosion. Zach Mouzoun, who arrived on a flight from Geneva about 10 minutes before the airport blasts, told France's BFM television that pipes ruptured, sending a cascade of water mixing with victims' blood. Marc Noel was about to board a Delta flight to Atlanta. The Belgian native, who lives in Raleigh, North Carolina, said the first blast happened about 50 yards (meters) from him. "People were crying, shouting, children. ... It was a horrible experience," he said. A random decision to pause in a shop to buy a magazine may have saved his life. Otherwise, he said, "I would probably have been in that place when the bomb went off." Deloos said a colleague shouted at him to run as the blast sent clouds of shredded paper billowing through the air, and "I jumped into a luggage chute to be safe." Passengers on other trains said many commuters were reading about the airport attacks on their smartphones when they heard the subway blast. Hundreds fled from stopped trains down tunnel tracks to adjacent stations. Many told stories of having missed the bomb by minutes or seconds. Brussels Mayor Yvan Mayeur said more than 100 were wounded in the subway blast. Rescue workers set up makeshift first aid centers in a nearby pub and hotel. "It was panic everywhere. There were a lot of people in the metro," said commuter Alexandre Brans, wiping blood from his face. Political leaders and others around the world expressed their shock at the attacks. "We will do whatever is necessary to support our friend and ally Belgium in bringing to justice those who are responsible," U.S. President Barack Obama said, ordering American flags lowered to half-staff through Saturday. Belgium's king and queen said they were "devastated" by the violence, describing the attacks as "odious and cowardly." After nightfall, Europe's best-known monuments - the Eiffel Tower, the Brandenburg Gate and the Trevi Fountain - were illuminated with Belgium's national colors in a show of solidarity. Former NYPD Commissioner Ray Kelly joined us to discuss the terror attacks in Belgium.